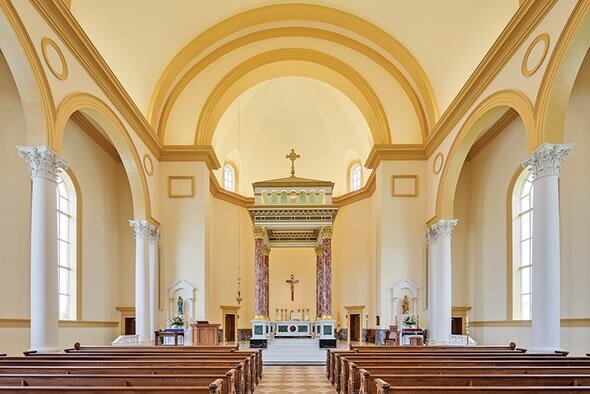 Duncan G. Stroik, Architect, LLC designs a new, red brick Romanesque church in Spartanburg, S.C.
It’s not every day that one receives a call from a priest requesting one’s design services for a new church. But if that day comes, you’re certainly going to pick up the phone. That’s exactly what Duncan G. Stroik, Architect, LLC., did in 2012. 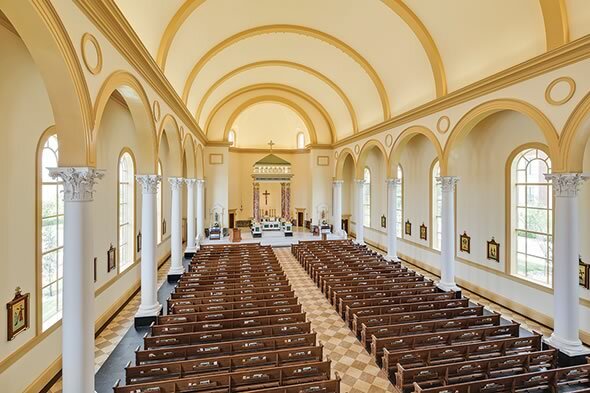 According to the firm, the pastor of the Saint Paul the Apostle Catholic church in Spartanburg, S.C., was familiar with its award-winning work and wanted the firm to design a new place of worship for his growing congregation. Between June 2012 and December 2013, Duncan G. Stroik completed all of the design work and oversaw construction of the $8.2-million project. In the firm’s own words, this is how the new church came together. The new Saint Paul the Apostle church is large enough to hold its congregation. No more masses in the school gym. Spartanburg, S.C., is a charming city of 37,000 residents and counts a large number of fine churches among its historic buildings. The downtown Catholic parish of Saint Paul the Apostle had by the mid-1990’s outgrown its small historic church built in 1883. For the past 20 years, the masses had been held in the school gymnasium. Thus, the pastor wanted a new church that would be large enough to accommodate his congregation – a facility designed to lift their hearts and minds to prayer. Detail of one of the interior columns shows the intricacy of the carve work. To build the larger church, the parish decided to take advantage of its urban location on a prominent site on East Main Street. 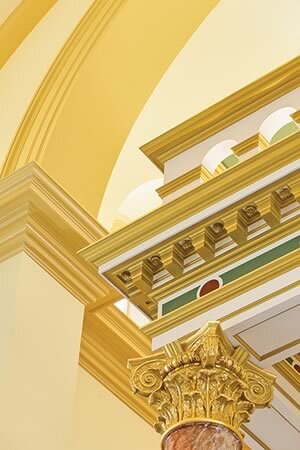 The traditional design of the new church reflects the universal Catholic faith and heritage, while also drawing specifically on Catholic architecture in the United States and the Lombard Romanesque tradition. The traditional style of the church extended beyond its aesthetic appearance and included the choice of building materials and construction method. 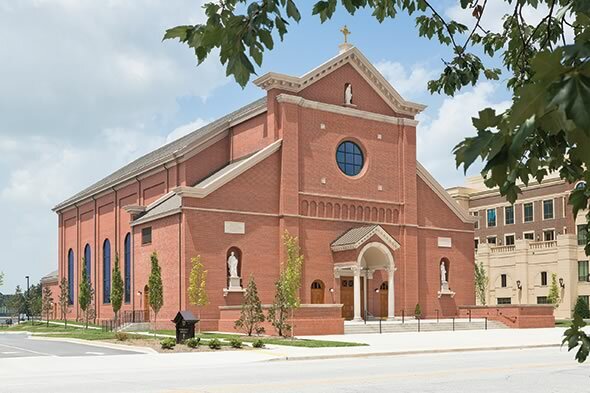 A load-bearing masonry structure with a brick Romanesque exterior created a durable building that will serve the parish long into the future. The handsome red Flemish bond brick and limestone-trimmed façade is set back from the street to create an inviting gathering space in front of the church. A set of stairs rises to the Corinthian arched prothyron covering the entrance doors that are the threshold into the sacred space beyond. A limestone lunette above the entry contains a bas-relief carving of the conversion of Saint Paul. Statues of Saints Peter and Paul flank the entrance to the right and left, while a statue of the Blessed Virgin Mary looks on from a niche in the pediment above. A large circular window, limestone carvings of the four Evangelists, a row of intricate brick arches, and a painted metal Celtic cross surmounting the pediment, complete the façade. A masonry structural system was selected for its durability, natural sustainability, and cost effectiveness. Based on two cost estimates, it was less expensive to build with masonry than it would have been to use structural steel. 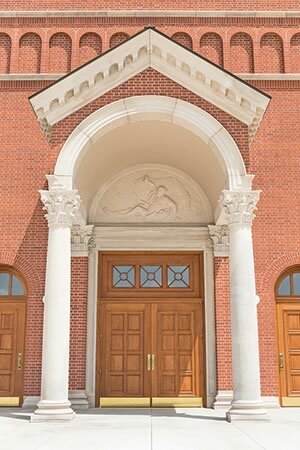 The aesthetic of the red brick Romanesque façade with limestone accents also was very appealing to the client. The marble used in the interior was concentrated in the sanctuary, which is the most important part of a church during the liturgy. Therefore, a higher-quality material was appropriate for that location. Marble was used extensively for the interior of the church. The structural system is made up of a brick cavity wall with CMU backup. Limestone detailing was used on the exterior of the church, as well as for the three carved statues of Paul, Peter, and Mary. Inside, marble was used for the main altar and baldacchino column pedestals, the altar for the tabernacle, two side altars, the sanctuary floor and steps, and the altar rail. A limestone lunette above the entry contains a bas-relief carving of the conversion of Saint Paul. Duncan G. Stroik designed the brick layout for the building down to the last brick. Further, the architect designed the building with a load-bearing masonry structural system. After an initial cost estimate, the estimator suggested it would be cheaper to use a structural steel system. The architect re-designed the building using structural steel, including a revised brick layout. After a second cost estimate, however, it was discovered that the new system was actually more expensive, so the team decided to go back to structural masonry. During construction, it was difficult for the bricklayers to match the brick layout completed by the architect; the brick layout was more complex and precise than previous projects the contractor had completed. Several areas of installed brick had to be rebuilt during construction to match the architect’s details, such as the Flemish bond and the round window of the front façade. But in the end, it all came together beautifully. The Palladio Award, Special Award, 2014, Cathedral of Saint Paul Organ Case. Saint Paul, Minn.
Acanthus Award of Arete, 2013, Cathedral of Saint Joseph. Sioux Falls, S.D. Institute for Classical Architecture and Art, Chicago-Midwest Chapter. The Palladio Award for Renovation and Restoration, 2013, Cathedral of Saint Joseph. Sioux Falls, S.D. Shrine of Our Lady of Guadalupe. La Crosse, Wis. Honor Award, 2011, Our Lady of the Most Holy Trinity Chapel. Thomas Aquinas College, Santa Paula, Calif.
American Institute of Architects, Northern Indiana. The Palladio Award, 2011, Our Lady of the Most Holy Trinity Chapel. Brick in Architecture Bronze Award, 2010, Saint Theresa Education Center. Sugar Land, Texas. The Brick Industry Association. Tucker Design Award, 2010, Our Lady of the Most Holy Trinity Chapel. Thomas Aquinas College, Santa Paula, Calif. Building Stone Institute. Architect: Duncan G. Stroik, Architect, LLC, South Bend, Ind. 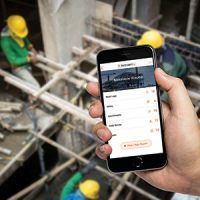 Construction Manager: Harper Corporation, Greenville, S.C.
Masonry Contractor: Gates Construction Co., Inc., Mooresville, N.C.
For daily reporting and compliance management on the jobsite, Raken has been named the #1 Daily Reporting Software App and Top 5 Mobile App for Construction at AGC National. Lighting and heating, ventilation and air conditioning (HVAC) are the two largest uses of energy throughout the commercial building sector. In fact, lighting alone accounts for nearly 35–50 percent of total electricity consumption. Within the building envelope, however, lies the opportunity to reduce the energy being consumed and decrease a building’s overall carbon footprint. 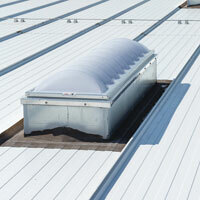 Achieving sustainability within the building envelope starts with specifying the right products. Choosing eco-friendly products doesn’t just ensure lower energy costs; it can enhance occupant health and reduce any negative impact on the building itself, as well as the environment. Brick Industry Association (BIA) member manufacturers around the country report that residential and commercial trends include whites, light greys, ivories, rough-hewn textures, glazed brick, and larger brick sizes.